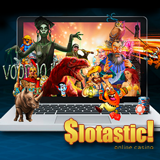 Slotastic Casino is a great place to play RTG games but, until now, it didn't have a mobile casino. The casino, which has been around for a few years now, added a new mobile casino as part of a big re-design of the website and the downloaded casino client. It's a big deal for Slotastic and their celebrating by giving all players 10 Free Spins on one its most popular new games, Wild Wizards. Until April 30 you can claim your free spins by entering coupon code SLOTASTIC10 when depositing. Slotastic's slick new site re-design makes it even easier to get straight to the games. You can either download and install the casino games or choose the instant play games and get right to the tables. I think the games load up faster when you download and install but instant play games are good when you're not at your usual computer. Bonuses and free spins now available to celebrate Slotastic Casino's new look and new mobile casino. The new mobile casino features 25 mobile casino games -- slots plus Blackjack and Keno. They're from RTG. If you've read my previous blogs then you know I like Realtime Gaming's mobile games! Slotastic has them all including The Three Stooges, Triple Twister and Loch Ness Loot. Logon from a smartphone or tablet and you'll automatically get the games designed specifically for smaller tap-and-swipe screens. Slotastic will double your deposit (up to $400) until the end of April if you use coupon code NEWSLOTASTIC when you deposit.